Transparency Market Research (TMR) in a report has stated that the Asia Pacific offshore wind energy market is fragmented as in nature. While the market exhibits the presence of several regional and international players, the leading market share was held by merely three companies. According to TMR, the three leading companies accounted for 31% of global offshore wind energy market in 2016. Almost every sector within the market exhibits considerable representation from both regional and international players. Some of these sectors are operations and maintenance services, installation and commissioning, supply of wind farm components and equipment, and project development and management services. In order to strengthen their foothold, regional and local players alike invest in research and development activities. This is also intended to build high-capacity turbines and cost-effective products. It is important to note in this regard that foreign companies are considered excellent in terms of technological advancements. The prominent players in this market include Goldwind Science Technology Co., Ltd., GE Wind Energy, Suzlon Group, Dong Energy A/S, Vestas Wind Systems A/S, Nordex S.E., Gamesa Corporacion Technologica S.A., Siemens Wind Power, China Ming Yang Wind Power Group Ltd., and Sinowel Wind Group Co., Ltd. 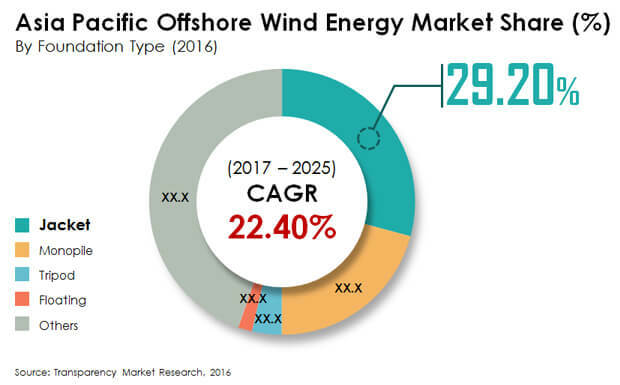 This report by Transparency Market Research has estimated that in 2017 the value of the Asia Pacific offshore wind power market was valued at US$8,960.8 mn in 2017 and is estimated to reach up to US$60,201.5 mn by 2025, with a health CAGR of 22.4% over the forecast period 2017-2025. Among foundation types such as tripod, jacket, floating, monopole, and others, the others segment had a dominant share of 44.7% in the Asia Pacific offshore wind energy market in 2016. This others segment includes foundation types such as ground mounted foundations and high risk pile cap (HRPC). This report states that, geographically, China owns the leading share in the total market owing to the presence of some of the region’s leading players and large number of previously installed and planned offshore wind energy plants. Offshore wind energy provides more benefits than existing onshore wind energy, which is expected to boost this market. Furthermore, factors such as high noise generation around onshore wind farms and complications related to land acquisitions are motivating industrial giants to adopt offshore wind energy over onshore wind energy. Moreover, feasibility of land, which is affected by the environmental conditions of land to construct onshore wind farms are channeling the market of onshore wind energy to offshore wind energy. These trends are expected to fuel the market for offshore energy for the forecast period. The technology for offshore wind turbine solutions is at nascent stage. Planning and set-up phase of offshore wind farms need higher investment than onshore farms. These incurred costs can affect this market adversely. Furthermore, complex grid structures are required for transmission and storage of electricity produced, this lead to higher cost of generation and distribution of power which may act as a restraint for the market growth. Additionally, other green energy markets such as onshore wind energy and solar energy act as direct competitors for this market, which may limit this market. Nevertheless, the technology is still being developed and new solutions which will cause effective and efficient power generation from offshore wind farms are being explored. These continuous research and development activities are expected to sustain the overall market.